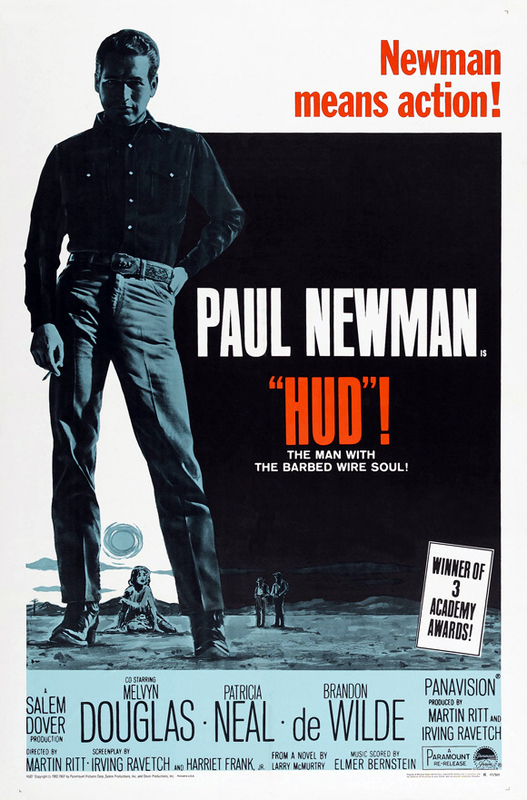 Synopsis: Self-confessed ruthless jerk Hud Bannon (Paul Newman) spends his nights brawling in bars and sleeping with the women (married and unmarried alike) of his small Texas town, and his days avoiding the responsibilities designated to him by his ranch-owning father Homer (Melvyn Douglas). 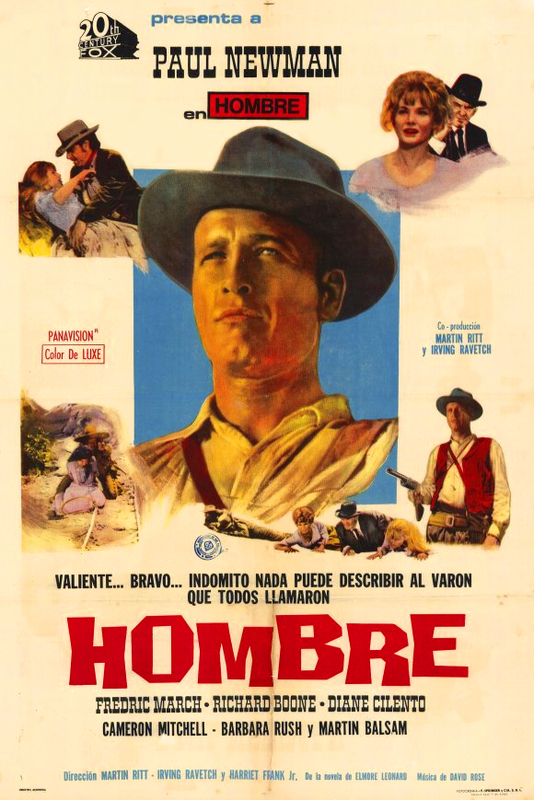 He also unwillingly takes on the function of role model to teenage nephew Lonnie (Brandon De Wilde), who is finally coming of age and trying to decide what kind of man he wants to be: a principled cowboy like Homer, or a pleasure-seeking ladies’ man like Hud? Hud spends his remaining free time trying to get under the skin of world-weary housekeeper Alma (Patricia Neal), who seems to be the only woman in town immune to his charms. But the brewing conflict between Homer and Hud comes to a head when the local veterinarian (Whit Bissell) delivers bad news about the family’s cattle herd. With pressure from Hud to sell the infected herd off to unsuspecting neighbors, will Homer be able to maintain his lifelong dedication to stoic morality – even if it means losing everything he’s worked for? Patricia Neal (January 20, 1926 – August 8, 2010) was born Patsy Louise Neal in Packard, Kentucky, and grew up in Knoxville, Tennessee. After studying drama at Northwestern University, she landed her first Broadway job as an understudy in The Voice of the Turtle. Her second play, Another Part of the Forest, earned her the 1946 Tony Award (the first year the awards were presented) for Best Featured Actress in a Play. She made her film debut in 1949’s John Loves Mary opposite Ronald Reagan. That same year Neal appeared in The Fountainhead and began an illicit affair with her married leading man, Gary Cooper. In the early 1950s she appeared in several films, including the classic scifi drama The Day the Earth Stood Still (1951), before suffering a nervous breakdown over the end of her relationship with Cooper and returning to Broadway to star in a revival of Lillian Hellman’s The Children’s Hour. In 1953 she married British author Roald Dahl, with whom she would go on to have five children. Neal then starred in a string of hits, beginning with 1957’s A Face in the Crowd, directed by Elia Kazan; Blake Edwards’ Breakfast at Tiffany’s in 1961; and finally Hud in 1963, for which she won the Academy Award for Best Actress as well as the New York Film Critics’, National Board of Review, and BAFTA awards. However, public success was mixed with private tragedy. In 1960 Neal and Dahl’s four-month-old son Theo was left with permanent brain damage after his baby carriage was struck by a New York taxicab. In 1962 their daughter Olivia died at age seven due to complications from the measles. Finally in 1965, while pregnant with her fifth child, Neal suffered three strokes in rapid succession and was in a coma for three weeks. She gave birth to a healthy baby girl, Lucy, but it was doubted that Neal would ever walk or talk again, much less return to acting. However, Neal made a triumphant recovery from her strokes, due in no small part to her husband’s strict rehabilitation regimen. She made her long-awaited return to acting in 1967’s The Subject Was Roses, for which she was again nominated for an Academy Award. She would go on to appear in a variety of film and television productions throughout the next four decades, publishing an autobiography, As I Am, in 1988. Patricia Neal died from lung cancer at her home in Edgartown, Massachusetts, on August 8, 2010, at the age of 84.